Do you have a penchant for nostalgia and discovering dilapidated ruins? Rachakonda Fort, located in Telangana, will quench your thirst for curiosity. The Monsoon has finally hit Hyderabad, and we're gearing up for short road trips. Beckoning you to indulge in its history and greenery is Rachakonda — a hidden gem that abounds in dense jungles, natural rock formations. And of course, the Rachakonda Fort. This tiny village in Telangana is a mere 70 km drive from Hyderabad and the trip will get you hooked because of the ruins and the rock formations you'll spot on your way. 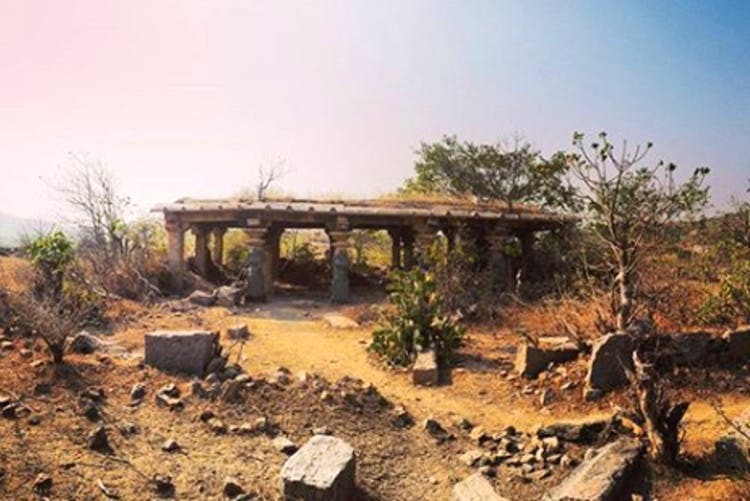 Hikers and trekkers can derive a certain joy from exploring and climbing these ruins, but if you aren't one, admire the beauty from a distance and reach Rachakonda in no time. Boulders, stone gateways, and a temple encompass the fort, that you can explore all you like. The architecture and carvings on the walls are truly glorious and give you a glimpse into the 14th century. But what sweeps you off your feet is the view from the top of the fort. Right from the jungle to the rocks and pond, you'll be able to see it all. Plus, you just cannot miss the sunset here. And now, grab your keys and follow your heart to the ruins. Getting there: Rachakonda is around 35km from LB Nagar, and barely has any public transport. Follow Google Maps and reach by using your car/bike. Please note that finding food and water can be difficult and we recommend you carry your own food and replenishments. With no stay option in Rachakonda, it's the best if you make this a short day trip.